Even for those who have never visited the city, much will already be familiar. This is thanks to the Italian film industry’s most famous film studio, Cinecittà. Founded in 1937 by Benito Mussolini, Cinecittà was once known as ‘Hollywood on the Tiber’. It produced thousands of films over its lifetime. The greatest Italian directors – Rossellini, De Sica, Fellini, and Pasolini – used the city like an enormous film set. The city also featured in films by Hollywood luminaries such as William Wyler and Joseph Mankiewicz. For a cinephile like me, a wonderful way of approaching the city is to rediscover the backdrops to some of my favourite films. One of the most potent images of Ancient Rome is the great amphitheatre begun by Vespasian in 75. During its 100-day inauguration, 1,000s of wild animals were slaughtered her. 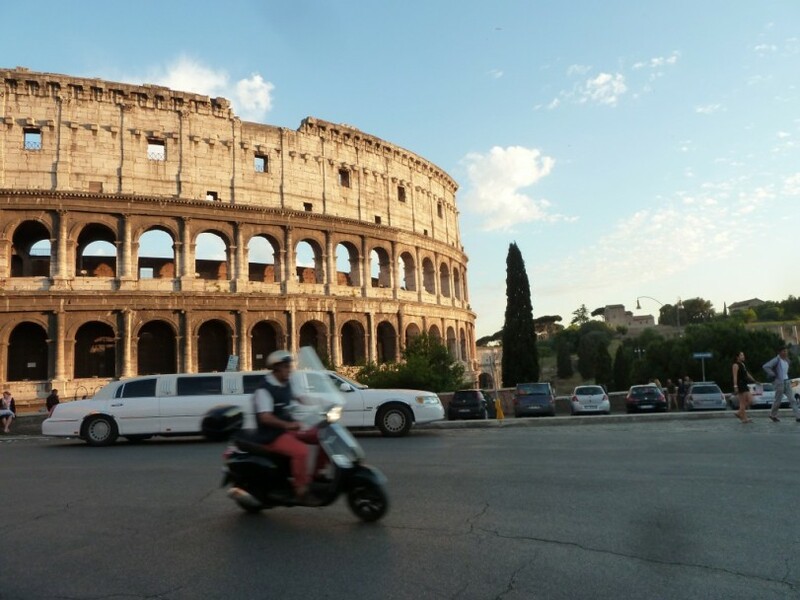 Its iconic image has been the backdrop in many a film – who can forget Gregory Peck and Audrey Hepburn whizzing past it on a Vespa in William Wyler’s Roman Holiday (1955). And when the real thing wasn’t available, much of Rome was recreated within Cinecittà itself. Most memorably in Ben Hur (1959), which became the largest film set ever built. In Ridley Scott’s Gladiator (2000), the Colosseum was restored to its 2nd century glory using computer-generated imagery (CGI). 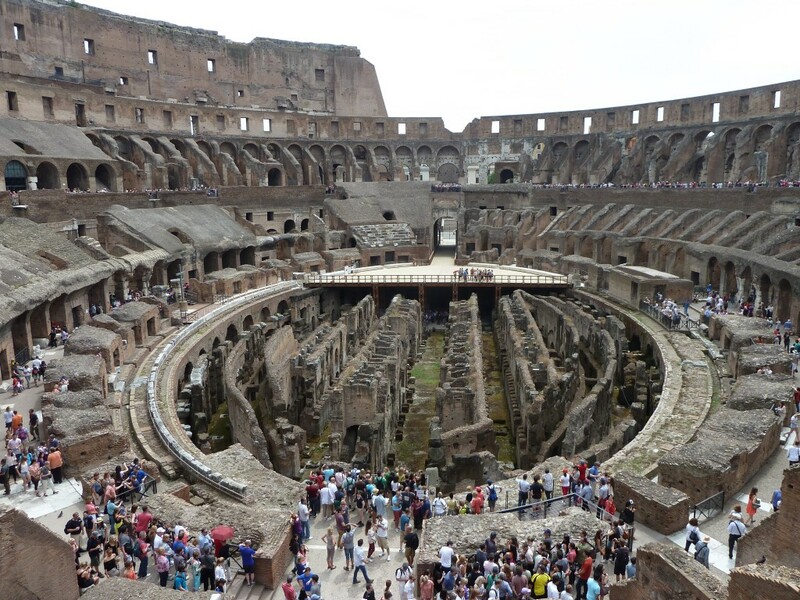 Today the Colosseum hosts spectacular exhibitions, the most recent being the story of Constantine. Built for Pope Clement XII and designed by Nicola Salvi, who started working on it in 1733, the fountain was completed by Giuseppe Pannini and inaugurated in 1733. But few who visit it have any idea of its history. They’re more likely to recognise it from that film scene where Anita Ekberg steps into the water wearing a strapless black gown and is joined by society reporter Mastroianni in Federico Fellini’s groundbreaking La Dolce Vita (1960). Today it’s forbidden to get into the fountain (black dress or not) but a tradition of throwing a coin over one’s shoulder (to ensure a return visit to the city) endures, and has resulted in thousands of pounds being given to charity. This famous landmark can be found to the left of the portico of the Church of Santa Maria in Cosmedin. It is thought that the stone was once a Roman sewer cover but it was moved to its current position in 1632 where it could be admired and mythologised. It is said that if you place your hand in the ‘mouth of truth’ and tell a lie, your hand will be chopped off. In a scene in William Wyler’s Roman Holiday (1955) American reporter, Bradley (played by Gregory Peck), relates this story to naïve Princess Ann (Audrey Hepburn) and demonstrates it by putting his hand in and crying out with pain. 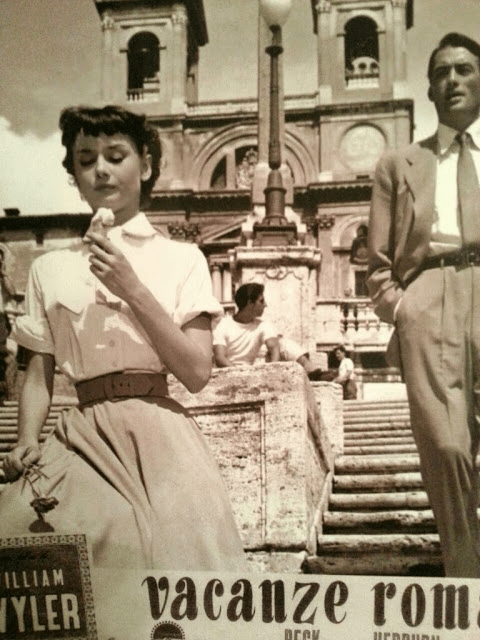 Ice cream tip: Peck also introduces ‘Princess Ann’ to ice cream by the Spanish Steps (see above) and, while no trip to Rome is complete without a gelato (or six), I’d recommend checking the price before you buy. 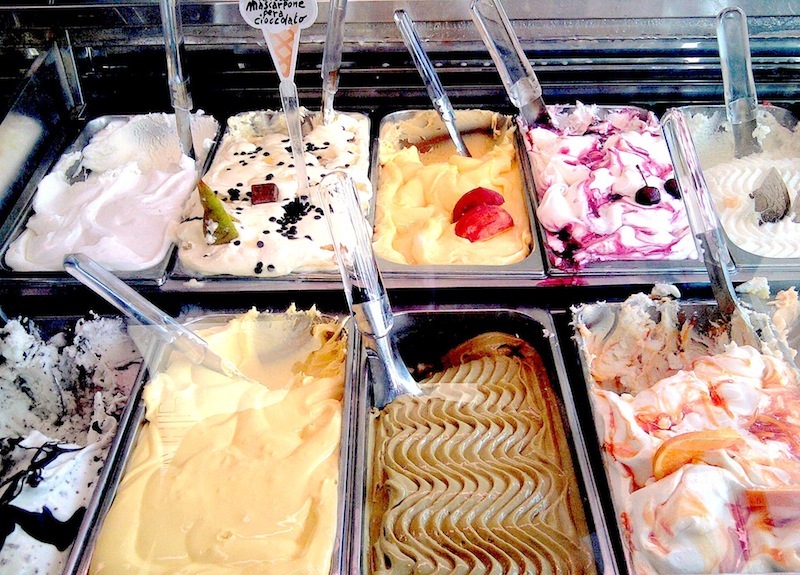 One of the best, and oldest, gelateria (founded in 1880) is Palazzo del Freddo (Via Principe Eugenio, www. Palazzodelfreddo.it), serving over 30 flavours. In Trastevere, this is Rome’s biggest flea market and the port gate that it takes its name from was first built in the time of Honorius in the early part of the 5th century. Though demolished in 1643 it was immediately rebuilt several hundred metres back from the original and from the time immediately after World War II it was used as a market place. In De Sica’s neo-realist I Ladri di Bicicletta (1948, Bicycle Thieves), the father and son go to the market to search, in vain, for the precious bike that was stolen from them. The market, at Via Portuense and Ippolito Nievo, is still popular and every Sunday (6.30am-2pm) Romans goes in search of a bargain and, increasingly rarely these days, the occasional antique. The piazza took its name from the ‘agones’ or competitive games that were once held here when it was an athletics stadium. It’s possible to see part of the original arena, sub-street level, at nearby piazza di Tor Sanguigna 16. From the 15th century right up until 1869 the square was a market-place. These days it’s better known for its spectacular marble ‘Fontana dei Quattro Fiumi’ by Bernini. The piazza also makes an appearance in Vittoria De Sica’s Ieri, Oggi, Domani (1963) where Marcello and Loren meet up again. Loren plays a ‘woman of the night’. By the end of the film Marcello is entertained by Loren’s saucy striptease in her rooftop apartment that, rather improbably, overlooks the piazza. The most famous chapel in the world has had an entire film dedicated to it, or at least to its creator. Carol Reed’s The Agony and the Ecstasy examines the four-year period when Michelangelo was painting the Sistine Chapel. From an 18-metre scaffold, he has regular skirmishes with his Pope Julius II, who commissioned the work. The resulting artwork is a masterpiece (the film has its moments too). It includes a self-portrait of a rather miserable Michelangelo being held by St Bartholomew. Needless to say, the film wasn’t made on location. Visitors can see the 930 square metres of Creation (ceiling) and the Last Judgment (behind the altar) frescoes when visiting the Vatican Museums. Bernini’s father was also a sculptor and responsible for the ‘Fountain of the Old Boat’ at the bottom of the Spanish Steps. Pietro Bernini created the boat-like structure in 1629 and some of the decorations were made by his more famous son, Gian Lorenzo. Rimini-born Federico Fellini moved to Rome in 1939 and he tells the story of his journey in the episodic film Roma (1972 ). 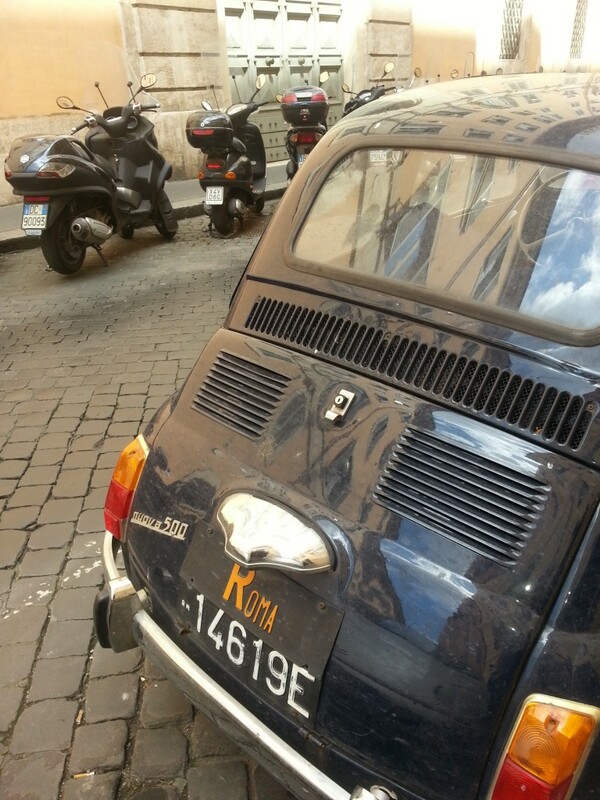 There are scenes of motorcycles with flashing headlights racing past ‘La Barcaccia’. These are a far cry from the sound of trickling water, said to be heard by Romantic poet, John Keats on his deathbed, in nearby 26 Piazza di Spagna. Today, it’s often hard to see the sculpture itself, thanks to the hordes of tourists. It is, however, possible to stay in the building where Keats died, as rooms are rented out by the Landmark Trust. Roberto Rossellini’s Roma, Città Aperta (1945) focuses on the Nazi occupation of the city. There are terrible consequences for its residents, especially the Italian resistance. Anna Magnani plays pregnant Pina, who is gunned down while chasing a van her fiancé has been forced into. Aldo Fabrizi plays a Catholic priest who sees his work with the resistance as the work of God. He is captured while escorting a German defector along Via Casilina. Today Via Casilina forms the southern boundary of an area known as Pigneto, with Porta Maggiore to the north. It’s renowned for its good restaurants and bars. Check out Ciak Si Mangia (Via Giovanni Brancaleone 72, +39 06 2753017, www.ciaksimangia.com). There is plenty of film paraphernalia, including a pic of Anna Magnani. Even some pizzas are named after films. This park, at the edge of the city along the Appian Way, is not on the hit list of many visitors. But it features some of Rome’s finest aqueducts and is well worth a stroll. Fans of Pier Paolo Pasolini will recognise it as the backdrop to a scene in Mamma Roma (1962). Anna Magnani is trying to break from her past as a prostitute in order to give her son a better future. She tries her luck as a vegetable seller, struggling along the road with a heavy cart. You can clearly see the Claudius aqueduct behind her. Mamma Roma was Pasolini’s response to Rosselini’s Roma, Città Aperta. He was keen to point out that Rome’s destruction couldn’t simply be blamed on the occupation. Post-war, Romans might look to themselves as well. Hadrian in 119AD initiated this extraordinary feat of engineering. In spite of its despoliation over the years, it’s still a wonder to behold. The diameter of the dome is exactly equal to the height of the entire building, and could accommodate a perfect sphere. Legend has it that there was a time when there was no hole in the roof. Another legend posits that the 9-metre oculus was created by the horn of a huge devil. Unlikely. The Pantheon has a small part in Steven Soderbergh Ocean’s Twelve (2004). The oculus can be seen above the head of detective Isabel (Catherine Zeta-Jones) as she attempts to foil the team of super-thieves. Film fans should take the opportunity to visit Cinecittà where they can wander down fake Renaissance streets. It’s where Scorcese shot part of The Gangs of New York (2002). Visitors can also see some of Fellini’s costumes and find out about 75 years of Cinecittà.